Prepare all toppings before you start cooking the filling. Dice veggies, wash cilantro well, and crumble the Cotija cheese. In a large skillet, add a drizzle of neutral oil over medium heat. Add beef and cook until browned well, breaking up the beef as it cooks. Add seasoning packet from Old El Paso™ Taco Dinner kit along with 1/4 cup water. Stir seasoning into the beef. Add 1/4 cup taco sauce to the beef and turn heat down to low when beef is cooked and seasoned well. At the very end of cooking, stir grated cheddar cheese right into the beef so it melts as you are serving the tacos. To make a taco, very lightly smear a tortilla with mayo. Pile on some of the cheeseburger taco mix, and top with any and all toppings you like. It’s pretty hard to improve on tacos and burgers, but this quick recipe mashup takes a little from each and results in one delicious meal. More good news: It’s also superfast. It’ll be on the table ready to be devoured in about 30 minutes! To start the filling for these tacos, add lean ground beef to a skillet with a drizzle of oil. Let that cook until the beef is browned. Then add some Old El Paso™ taco seasoning. I add the whole packet, but you could do half if you want it less spicy. Also, add a little water to the skillet (1/4 cup works to start) so the seasoning can cook into the beef. While the beef is cooking (or before), prepare all of the toppings. Most importantly: diced onions, tomatoes, avocado, and cilantro! Okay. Now for the cheeseburger trick that you’re gonna have to trust me on. Take your flour tortilla (or hard shell taco) and smear a really tiny amount of mayo on the tortilla. Trust me when I say this completely makes the taco. Leave it out at your own peril! Then pile on the cheeseburger filling along with a big mess of toppings. I like all the veggies plus some crumbled Cotija cheese and extra hot sauce. These tacos are definitely better than the sum of their parts. 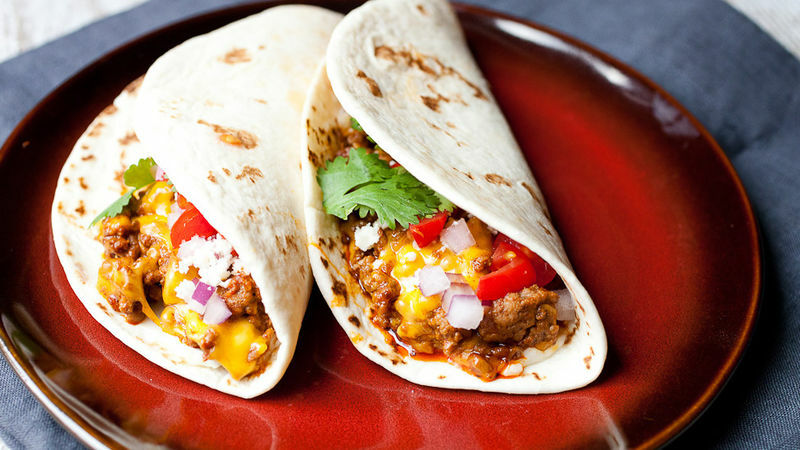 If you’re a Tex-Mex lover (or a cheeseburger lover), these are a must try! Nick thinks Tex-Mex is always a good idea! Check out his blog, Macheesmo, and follow him on his Tablespoon profile.